This Table Rock point, if compared to most other examples, is above average in size and skill in manufacture. 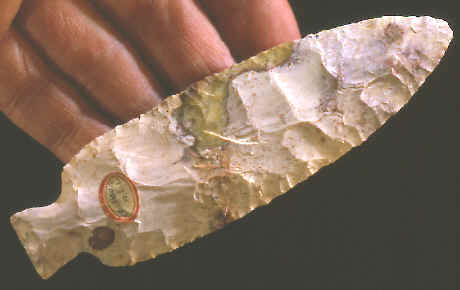 It was apparently never resharpened and represents an excellent example of this Late Archaic spear point or knife. This point was found several years ago by C.L. Harsaman in Pike County, Illinois. 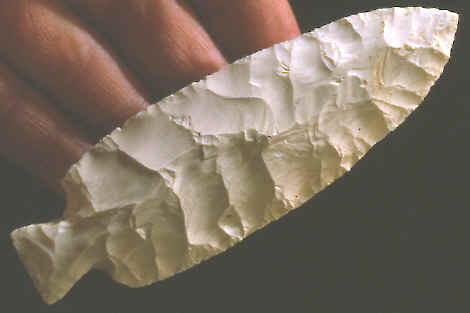 It’s made of white Burlington chert and measures 4 ¼ inches long. 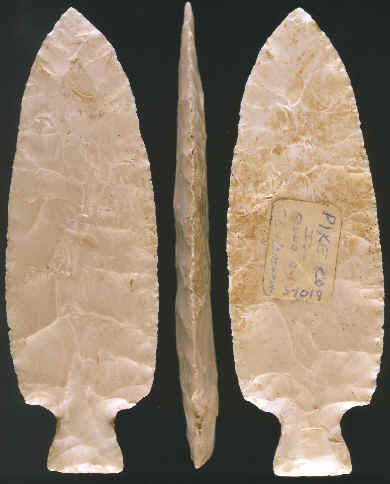 Table Rock points were named by Robert T. Bray in 1956 for examples found on the Rice site in the Table Rock Reservoir in southeast Missouri. He called them Table Rock Stemmed but most people use the shortened name, Table Rock, to describe them. Table Rock points date to the Late Archaic period sometime between 3,000 to 5,000 years ago (N. Justice 1987:124). 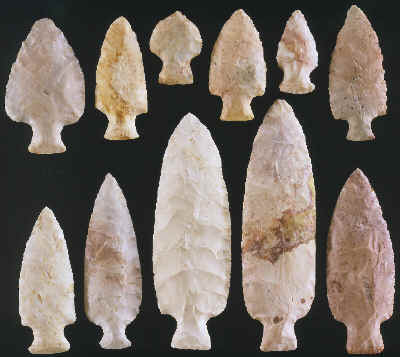 Table Rock points are found over a wide area in the eastern United States. They have been found within an area from eastern Oklahoma and most of Arkansas extending northeast to the southern edges of Wisconsin and Michigan to eastern Ohio. Their sites tend to be thin which suggests that these people were moving around a lot (G. Perino 1985:371). Table Rock points are generally very well made with percussion and fine pressure flaking. They were also a successful design as far as breakage is concerned. A good percentage of them are found unbroken. These points were bifacially resharpened and one interesting trait is that the stem edges are usually very heavily ground. Some of these points were made with heat treated chert and are quite colorful. They can range in size from 1 ¼ to over 4 ½ inches long.